In part one of my primer on using Kicktraq, I explained the upper third of the Kicktraq project page and in another previous piece I also looked at the Kicktraq Hot List in relation to a Kickstarter project. In this week’s article we’ll continue examining a project’s Kicktraq page, this time concentrating on the middle third of the page. The middle third of a Kicktraq project page contains five different tabs that contain more granular information about a particular Kickstarter project. The information in these tabs is useful for both project backers and creators. Let’s look at each of the tabs in a little more detail. 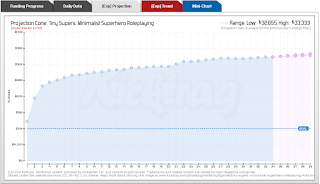 The funding progress tab tracks a Kickstarter project’s progress toward its funding goal from the beginning date of the project to the ending date. The Y access of the chart shows the pledged amount starting at zero. The amount shown on the Y axis increases in increments of 5k. Along the X axis are the dates of the project is active. The chart shows a blue dotted line across the graph for the funding goal. It will also show a green dotted line that adjusts for the project funding trend. 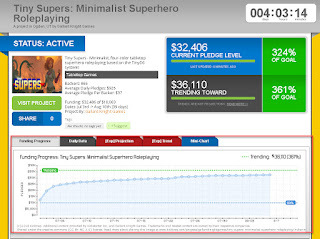 Kicktraq will plot a point at each day for the project’s funding. We’ll cover the uses of this and other tabs in a bit. For now remember that when looking at the funding trend it is important to keep in mind that the trend is not 100% accurate. If you are a data nerd and want to delve into how you can predict the success of a Kickstarter campaign using various indicators you can read this whitepaper by Swiss researchers. 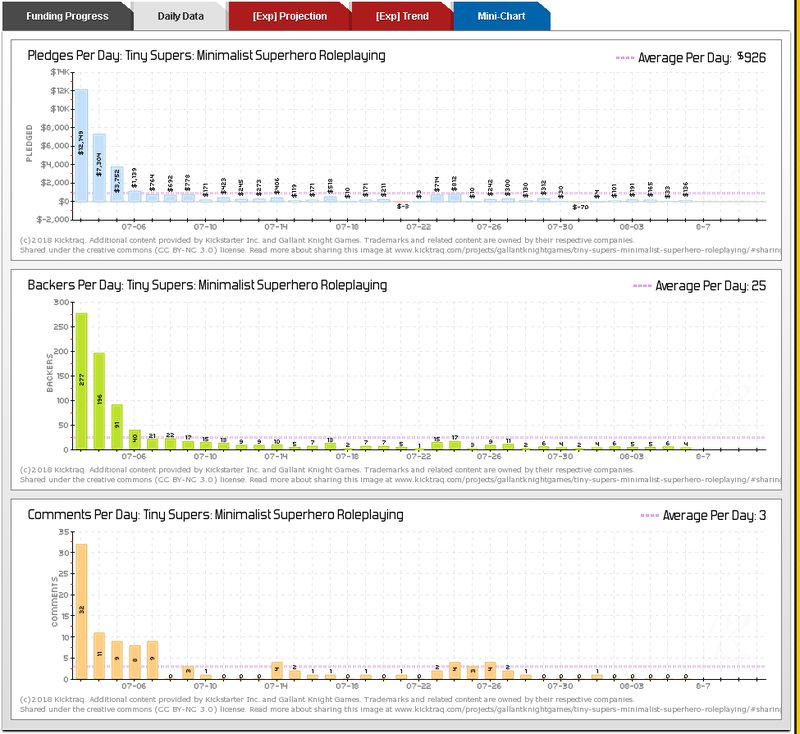 The Daily Data tab contains three separate charts – Pledges Per Day, Backers Per Day, and Comments Per Day. This chart tracks the amount pledged by backers for each day of the Kickstarter project campaign. This chart shows a purple dotted line for the average amount pledged per day. This is summarized in the upper right of the chart. 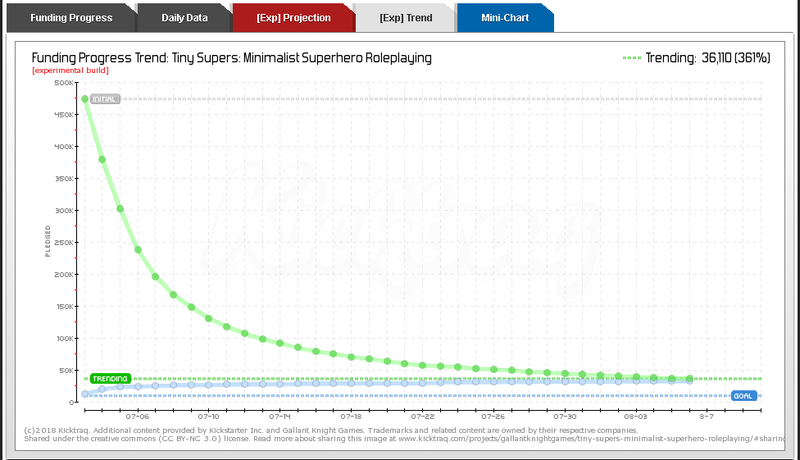 This chart mimics the Pledges Per Day chart replacing pledge amount with the average amount of backers per day. Averages are shown as per the Pledges Per Day chart. This charts the average comments per day on the Kickstarter project like the above two charts. The Projection tab displays the current funding data for the project and gives a projection of the end funding. Currently this project is called the “Project Cone”. 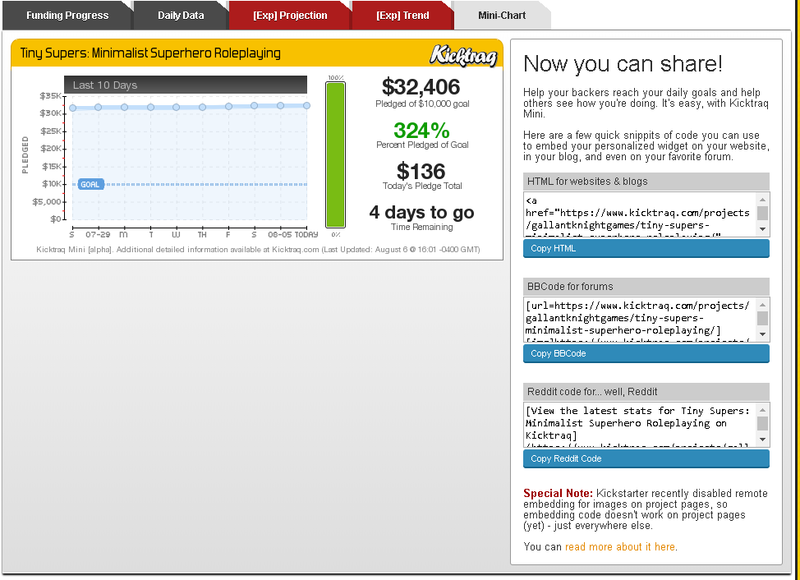 Be aware that the way this tab displays as Kicktraq experiments with how to display and predict data will change. The project’s goal is shown as a straight dashed horizontal blue line across the graph. This projection is expressed as a high and low dollar range and summarized in the upper right of the chart and shown as a purple line. 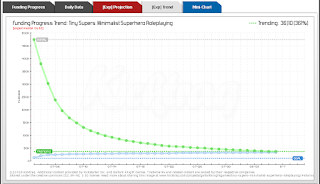 As I stated before and has been mentioned by Kicktraq themselves, projection data is not 100% and depends on several factors. 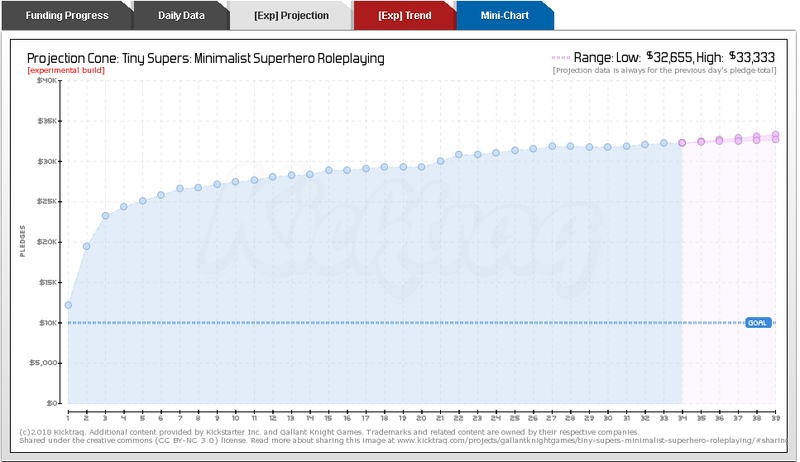 However, Kicktraq gets about a 70-92% average correct prediction on many projects. You should expect this to be a work in progress and while the projection is not a 100% guarantee, it never-the less is an important tool to use when adjusting your Kickstarter campaigns and pledges. While the X and Y axis are familiar – dollar amount on the x axis and date on they axis - the data presented on this tab can look confusing. At the very top of the chart there is a dashed gray line indicating the initial funding trend. From the very top a green line with plotted points slopes down to meet the dashed green trending line. Just below the trending line is the dashed blue goal line and beneath that the actual funding plotted over the days of the campaign. Why is that green line curving down to meet the blue one and why did it start so high? Well, the trend is based on daily data and a variety of different weighted metrics. 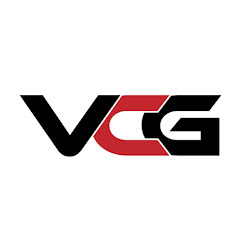 If the project owner did a lot of pre-launch work and built anticipation a project and then launched with a huge surge the numbers will be high. This huge surge can be very important to build momentum and drive toward funding and beyond. This is one of the keys to success to Kickstarter campaigns that we will discuss in future articles. This tab provides a nice summary of the project stats as well as a chart of the last ten days of campaign funding (a subset of the projection), a “battery meter” chart as well of summaries of the total pledged amount, average pledges per day, the current daily pledge and time left in the campaign. On the right-hand side of this tab you can find ways to embed the chart to share on websites, forums and Reddit. This data is dynamic and updates from the Kicktraq site. 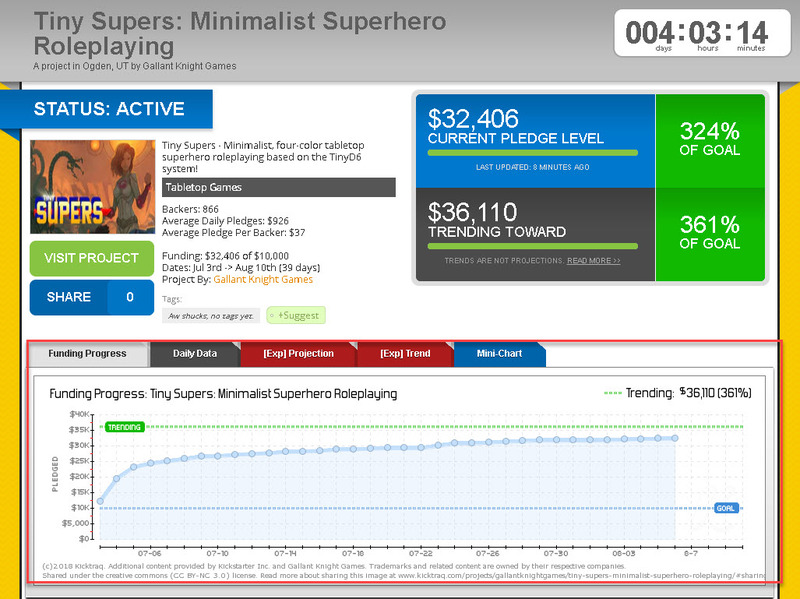 While an in-depth discussion of how to use Kicktraq’s middle third for working your Kickstarter campaign – or following one if you are a backer- is out of the scope of this article, I will cover this topic in further posts. For now, here are a few suggestions on how to use the data on the Kicktraq project middle third to work a campaign or help promote it as a backer. Search for and research past projects that are similar to your campaign and go over the day by day funding and backer trends. 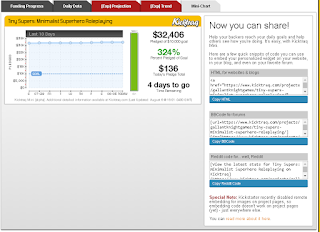 Then look at the Kickstarter campaign itself and correlate the data to the numbers. Learn from the successes and failures. Use the data on the tabs to find out where the lulls are in your campaign. You will want to encourage your backers and fans to share the Kicktraq page, suggest tags and post to forums and websites. The more engagement you generate the better your numbers will be. Take screen caps of tabs and share across your social media networks. People love to see charts and summaries. Not only will this build buzz on your project but it’s a great way to add content to social media feeds which in turn drives more organic traffic to project pages and your website. The middle third of the Kicktraq project page is chock full of information that will help you adjust your Kickstarter campaigns in mid-flight. You can also use the information in the tabs to help generate interest on forums and social media. As a backer, you can track projects you are interested in and use the data to adjust your level of involvement. In our next article we will talk about the final section of the Kicktraq project page. Until then – Game On! Michael Harrington is a cybersecurity course designer and instructor by trade and an self-diagnosed RPG addict. He first started playing TTRPGs with the original TSR Dungeons and Dragons back in elementary school.